Neuroscientific research provides evidence for meditation affecting the brain and improving health, well-being and cognitive performance. 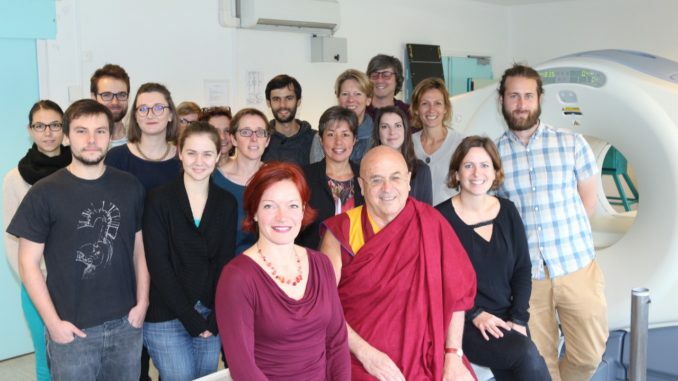 The Silver Santé Study, currently the biggest European neuroscientific meditation research project, investigates the benefits of meditation for the elderly. Study participants who meditate, learn the English language, or do not engage in any particular activity over a period of eighteen months undergo a number of neuroscientific measurements in order to investigate which lifestyle choices are beneficial for healthy aging. Research that demonstrates the beneficial effects of meditation has contributed to the positive reputation of the practice . Meditation has been advertised as a natural remedy and has even been introduced as a “green approach to sustainable enhancement” in a talk on “meditation practice and an ethic of brain friendly modulation” during the Annual Meeting of the International Neuroethics Society in 2015. Despite this suggested “greenness” of meditation and its research, reflections on ethical challenges should not be neglected. Ethical challenges may be related to the consequences of such research. These may include the institutionalization of meditation to reach productivity targets, the responsibilization of the elderly for preventing their cognitive decline, or the promotion of an essentialist idea of culture when comparing experienced meditators from a variety of socio-cultural backgrounds to a Western, highly educated, and affluent group of research participants who learn how to meditate during a study intervention. Yet, ethics also play out in the research process and daily work practices. Whenever a decision needs to be made, values and considerations are weighed against each other. What counts as “ethical” or “unethical” is not fixed but fluid; it is situational, contextual, and audience-specific. I explore how ethics unfold in action, how they change over time, and how they are entangled with work practices, institutional constraints, material conditions in the laboratory, and other stakeholders’ concerns in the Silver Santé Study. Understanding ethics in action serves a dual purpose that combines knowledge production about and practice improvement within the Silver Santé Study. For this purpose, I conduct qualitative interviews with those involved in the study. I intend to make interviewees question their assumptions, widen the considerations they take into account when making decisions, and acknowledge the creative solutions they have already developed to navigate between tensions encountered in daily routine. In this way, stimulating ethical reflections may turn out to be beneficial for those I engage with in the Silver Santé Study. Walking the middle path between ethnographic knowledge production and interventionist practice improvement, I contribute to the body of work that has been realized under the label “Responsible Research and Innovation”, in short RRI. Since the turn of the millennium, academics and policy makers have developed the concept to make research and development more responsible. RRI projects aim to include a broad spectrum of stakeholders in ethical reflection and decision-making processes in scientific research and technological innovation. I hope to pursue this ideal by stimulating ethical reflections in interviews with a diversity of stakeholders, ranging from scientists, engineers, physicians, meditation and English instructors, to administrators, research funders, journalists, etc. In this way, my research puts RRI into practice in the Silver Santé Study and will result in suggestions for how to improve RRI’s implementation in other projects.